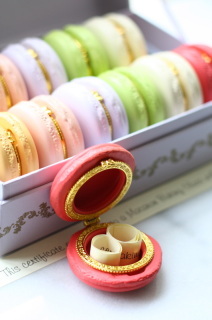 Imagine the look on her face when you propose to your gal with this charming French Macaron Ring Box! This beautiful Macaron Trinket box is crafted from resin with gold colored metal hardware to evoke memories of Paris. In-stock for immediate pick up: raspberry rose, light minty green, caramel, soft grey, soft yellow, peachy pink. Bright red and lilac are no longer available. Note: Diamond engagement ring NOT included. 1"H x 2"Diam when closed. Price listed is for 1 Ring Box. Please click on the below link to choose the color and to check-out. Shipping will be calculated once you submit your address.